Republican contender Donald Trump has surprised many pundits with his enduring appeal during the early stages of the GOP primary. Although Ben Carson has experienced a surge as of late, Trump retains substantial support among GOP primary voters. To better understand what animates Trump supporters, we used the new AVS 2015 to examine the ways in which Trump supporters differ from the supporters of other Republican candidates. They’re more likely to be white working class. A majority (55 percent) of Trump supporters are white working-class Americans. In comparison, only about one-third (35 percent) of those supporting all other Republican candidates identify as white working class. They’re more likely to cite immigration as a critical issue. 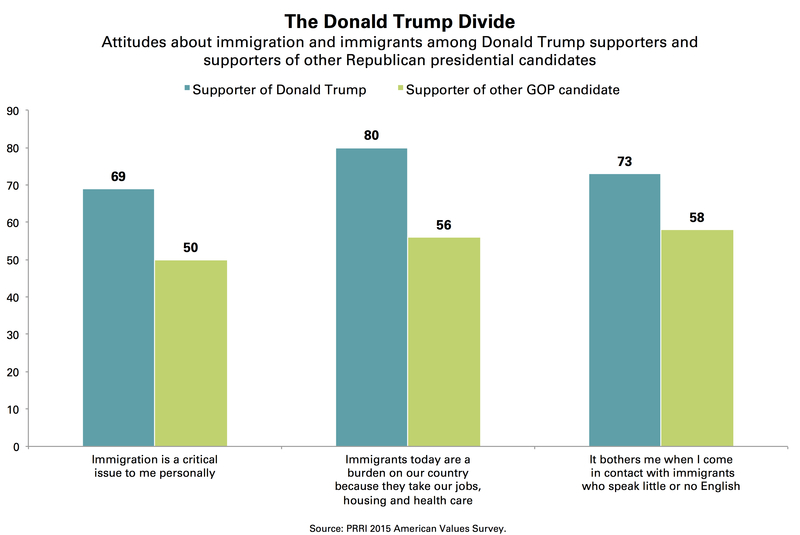 On no issue do Trump supporters differ more from those supporting other Republican candidates than on the issue of immigration. Nearly seven in ten (69 percent) Trump supporters say that immigration is a critical issue to them personally, while only half (50 percent) of those who support other candidates say that the issue of immigration is critically important to them. They’re overwhelmingly more likely to have negative views of immigrants. Eight in ten (80 percent) Trump supporters say that immigrants today are a burden to the U.S. because they take American jobs, housing, and health care, compared to 56 percent of those who support other GOP candidates. And 73 percent of Trump supporters say that it bothers them when they come into contact with immigrants who speak little or no English, compared to 58 percent of all those supporting other Republican hopefuls. They strongly believe Islam is at odds with the U.S. way of life. More than three-quarters (77 percent) of Trump supporters agree that the values of Islam are “at odds” with American values and way of life, compared to 72 percent of supporters of other GOP candidates and 56 percent of Americans overall. They believe in “reverse discrimination,” particularly that white men face discrimination. Roughly three-quarters (74 percent) of Trump supporters—compared to 57 percent of supporters of all other Republican candidates—agree that, today, discrimination against whites has become as big a problem as discrimination against blacks and other minorities. More than four in ten (42 percent) Trump supporters—compared to 30 percent of supporters of all other Republican candidates—say that white men face a lot of discrimination in the U.S. today.